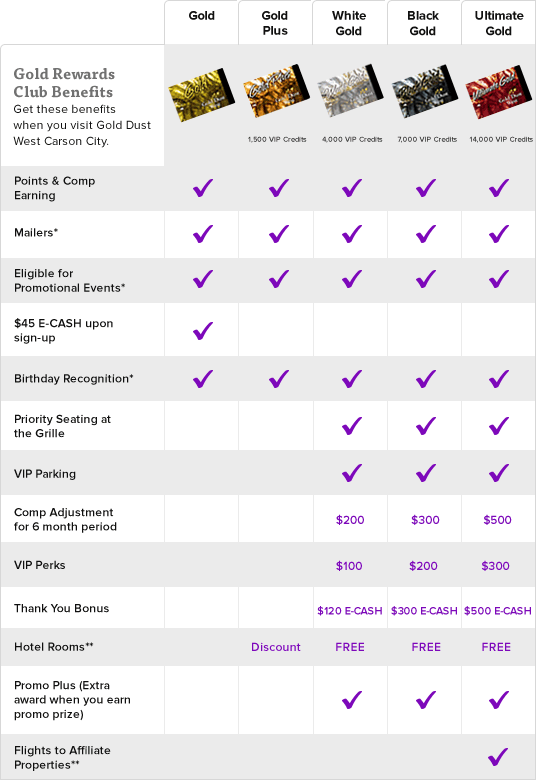 Gold Dust West’s Gold Rewards Club offers five levels, each with it’s own benefits. The higher your tier level, the more you’ll receive. Be sure to use your card every time you play and you could achieve our V.I.P. status. Every time you play with your Gold Rewards Card inserted into a slot machine, you’ll earn 1 point for every $1 in coin in. Redeeming your rewards is easy and convenient. Points are redeemable for E-CASH right at the machine. Just enter your pin number on the pin pad, choose option 2 for point play and follow the instructions. You can redeem 2,000 points for $5 in E-CASH. E-CASH is also available through the mail based on your play. After earning the required points you must see a Guest Services Representative to have your E-CASH added to your account. All E-CASH is valid until the expiration date. Every time you play with your Gold Rewards Card inserted into a slot machine or at the table games, you’ll earn comps. Just present your card at the Grille or Olé Olé Mexican Restaurant and Cantina and “Swipe & Dine” after enjoying your meal.